We’re in our state testing season (weak, sarcastic shout of ‘yea’ to the world), and this year, for the first time, our students are doing the entire testing regime (ELA this week and Math, in a few weeks) online. Although I integrate technology all the time into my sixth grade ELA classroom as means to extend the notion of composition, this use of technology for testing is obviously very different. And watching my students spend nearly three hours yesterday on the first of two sections of online testing for the state, as well as doing both review and practice with some of the technology tools within the testing structure, I have come away with a few observations. First, years ago, I took part in a week-long technology seminar in Boston for the New Literacies Institute (I still have connections with some of the leaders of that institute in various online space) and one of the research focal points of this group (mostly connected to the University of Connecticut and Professor Don Leu) was the notion of online reading comprehension — of thinking of how our reading habits with screens is fundamentally different than our reading on paper. 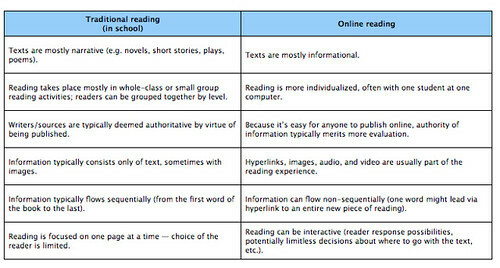 I even wrote about the nature of online reading myself, for the now defunct Learn NC (accessed now via Wayback Machine: https://web.archive.org/web/20170525150113/http://www.learnnc.org/lp/pages/6958 ) The chart embedded above was a crowdsourced activity I did, trying to hone in on the differences between reading experiences. I bring this topic up because I have some students who clearly struggle with reading the online text for comprehension, never mind the issues of source credibility and other critical items that Ian talks about in the video. While difficulties with online reading may have to do with the lay-out of the pages (texts are first displayed as full page and then reduced to a scrollable text box when paired with questions), I am realizing that I have not done enough to explicitly teach how to read for content and information on a screen. I remember this chart, too, which tracked eye movement of a reader reading on a webpage. A typical person on a screen reads in what is known as an F Pattern, first quickly across, and then down and then across, and then zigzagging for links and information. It’s a treasure hunt style of reading, not an act of continuity. Now imagine a student reader, who might have attention difficulties to begin with, trying to stay focused on reading a text on a screen, and how their eyes probably jump all over the place. Reading left to the right, and then down to next line, comes into contrast with how their brains are conditioned to read screens, for good or bad. This hampers the ability to fully understand the entire text as well as find important information. So I need to do a better job of teaching this, and not just for the test, but all the reasons that the New Literacies folks shared with me years ago: most people now read most of the texts in their lives on the screen (albeit, on the smaller screens). Online reading comprehension skills have to be part of our reading curriculum. Our state testing system — designed by, who else, Pearson — has some useful tools inside of it, which I taught my students to use during some practice sessions. There are highlighting features, a pop-out notepad, an answer eliminator, zoom features and a layered box that allows you to focus on just small bits of reading text at a time. There are also some questions where answer options can get dragged around the page, and I had few questions related to that (it wasn’t on the practice test), which makes me wonder how I might do some work with this (and think: paper cut-outs, perhaps, and manually manipulating chunks of text). I could only point them to the directions for the activity. One of the biggest challenges, I think, is the planning of the longer essays and narrative stories. I teach graphic organizers all year long and my students work with them for pre-writing all year long. And they have blank paper to use for the test, for graphic organizers or notes. But here’s what I observed: Fewer students than usual were making any kind of writing plan. If I had to guess, I would say this is likely the result of taking the test on the computer, and a disconnect between the paper on the desk and the writing on the screen. (And I can’t say a thing about it to any student during testing, even though I want to shout: Make a graphic organizer!). Their focus during testing is on the screen, on the keyboard, not on the pencil and paper on the desk, and I think either some forget, or decide it’s not worth the trouble, or whatever. I also know, from discussions before the text, that my confident writers were anxious about the character length limits for the longer writing (5,000 characters) and the little countdown box in the corner of the writing space made them even more anxious. They worried they would get to zero, and still have things to say. I had told them, if that happens, it’s time for some editing of what you had already written, and trim for clarity and importance. Which is what I would have said in any writing activity. But the character countdown box gave it a negative gamification element that I had not predicted. As a teacher, finding this balance of teaching students about writing and reading on the computer and reading and writing on paper, and the places where those skills naturally overlap, is important, and I will be doing more research on this. Probably, via my computer. There you go. PS — I was also thinking about a fascinating book I recently reviewed for Middleweb by Troy Hicks and Kristen Hawley Turner entitled Connected Reading: Teaching Adolescent Readers in a Digital World. There, the thinking was about real-life reading, about the act of taking reading skills beyond oneself and using technology to make sense of the world. What I have written up above here seems so far removed from that. I guess that’s state testing for you. This entry was posted in my classroom, New Literacies Initiative. Bookmark the permalink.